If you already have some maps installed, before acquiring new maps you should update the old ones. Go to Menu > My Navitel > Updates. If you see an update available, go for it by tapping Update. If the device does not have a single map installed, then you will be suggested to download or activate maps once you first start the program. Go to Menu > My Navitel > Download maps. 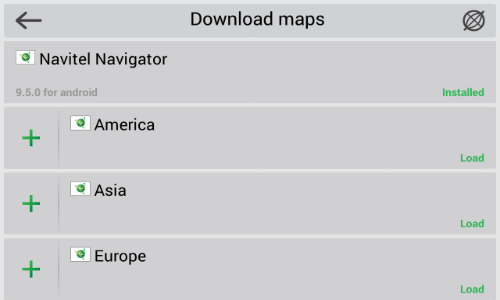 Select the map category you need, and then select the specific map that you want to download. Tap Download and confirm by tapping Yes. The program will install and index the maps. This method is not applicable for iPhone/iPad- and Windows Phone 7.x.-based devices. Before installing the new maps, make sure the application and the other maps are up to date. To learn how to update the program or the maps, see the instructions. Log into your personal account at NAVITEL® website. There, select My devices (updates), and then in the Update column, click Available updates. A page will open containing the list of available updates for all purchased and activated licenses. NOTE: If the device that you want to download the maps for is not added in your personal account yet, you should do it first. Select the necessary map from the list, and then click Download. Next, click Save and save the file into the folder \NavitelContent\Maps\ on your device. If there is no such a folder, create it and assign it the "NavitelContent" name, and then create the "Maps" folder inside that one, and transfer the files there. Make sure that the versions of your maps correspond to the version of app. It is recommended that a download manager be used to download maps. 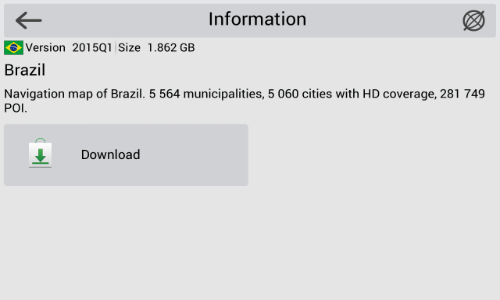 Make sure that the size of the downloaded map files is the same as stated at the website, otherwise the program will not be able to operate the map file that is incomplete. Disconnect your device from the PC, and then run Navitel Navigator. The program will index the maps and create a new atlas with the installed map.